Unfortunately, we cannot accept International order. However, rest assured LEO & LIN are working on this and we strive to serve our international clients shortly. Must be at least 8 characters long and is case sensitive. Subscribe to receive L&L emails with access to our latest collections, news and more. TITANIA LACE ONE SLEEVE DRESS, from our SS19 “A Midsummer Night’s Dream” Collection, in luxury panelled black lace. Features single sleeve, our signature high neck secured with hook&eye, match pattern cutting and handkerchief hemline. A $35 same-day delivery service is available in Sydney Metro, Monday through Friday, for orders placed by 1 PM AEST. Please note that LEO & LIN does not ship to P.O. Boxes and that all orders require signature upon delivery. Orders placed on weekends and public holidays will be dispatched on the next available business day. All items will be delivered with our signature LEO & LIN theme color: Moonlight packaging. • Your order will come with complimentary gift wrap in a signature LEO & LIN shopping box, elegantly tied with a LEO & LIN satin ribbon. Sign up for LEO & LIN updates to receive information about new arrivals, future events and special projects. ALL DELIVERY TIMES ARE APPROXIMATE. Regular Post (Australia) $12.50, 3-5 business days. * Please note that delays may occur in some countries due to customs processing. * Orders placed on weekends and public holidays will be dispatched on the next available business day. The shipment of your purchase will be handled by our shipping partner Shippit and therefore is subject to the policy and service terms of Shippit. All orders of in-stock items placed on a business day will be processed and shipped out within 2 business days. We will inform you via email or SMS when your order has been dispatched. This email or SMS will contain a tracking number to allow you to track the progress of your delivery with our freight. Deliveries are made during business hours. For more information with regards to delivery, please refer to Shippit website. Unless you instruct us to leave your purchase at your delivery address, our shipping partner will require a signature to ensure the safe and secure delivery of your purchase. If your purchase is left at your delivery address upon your instruction or if you enter a PO Box or a freight forwarder’s address and a delivery is made accordingly, we are not responsible for items that arrive damaged or missing or any additional shipping charges. If the intended recipients of your purchase are unable to receive the delivery or if the delivery is refused, our shipping partner may arrange with you for further delivery or pick up, which is subject to the service terms of our shipping partner. If your purchase is returned to us without any contact from you, a refund for the costs of your purchase less all shipping costs will be issued. Shipping costs are generally not refundable. Once an order has been dispatched we are unable to change your delivery details. If you have any concerned regarding your purchase, please contact our customer services team via email to customerservice@leoandlin.com within 21 days after you have received our delivery confirmation. In the unlikely event that your purchase arrives damaged or if it is inconsistent with your order, please contact our customer services team via email to customerservice@leoandlin.com within 2 business day of receipt of the delivery. You are required to keep all original packaging including all LEO & LIN and designer garment tag as originally attached. We do not accept returns if they do not come with their original packaging. LEO & LIN now provides same day courier service for our metropolitan customers in Melbourne. Same day delivery may be arranged if the delivery address is within Metropolitan Melbourne and if you complete your purchase on a business day before 1.00pm. Select the same day delivery option at checkout to receive a 3-hour delivery window Monday to Friday. Orders must be placed prior to 1pm in order to schedule same day delivery; alternatively if the cut-off time is missed, an order may be scheduled for next day delivery using our next day or scheduled delivery options. At LEO & LIN, we pride our self in maintaining the highest level of customer satisfaction. As a valued LEO & LIN customer, we will ensure that your buying experience is both pleasant and memorable. We offer a return service within 14 days of delivery or collection. Please note that goods that are made to order or purchased from our one-off sales department cannot be exchanged or returned. All returns should be requested before you send your purchase back to us. Any unidentified goods will be returned to the sender – at a cost borne by the sender. In the event that a return address is not provided the goods will be donated to charity. If you would like to exchange an item because the fit is not right, you must choose and advise us of the replacement size. Please note that all exchange is subject to stock availability. It is important to note that we are only offer size exchanges. If you wish to exchange your item for a different product, you should simply return it for a store credit and purchase the new item separately. Your return will either be credited to the original payment method or LEO & LIN account as store credit. The refund will only include shipping costs if it is a refund for faulty items. Shipping costs will not be refunded otherwise. Please note that refunds can take up to 10 working days or longer to show on your account due to varying processing times between payment providers. All returned goods must be new, unused, in its original condition and come with their original packaging including all LEO & LIN and manufacturer tags, seals, labels, information cards, dust bags or such other items as originally attached or enclosed. Otherwise we reserve our right not to accept the returns. LEO & LIN customers are protected under the Australian Consumer Law consumer guarantees. To arrange for a return, please contact us at customerservice@leoandlin.com or Log into your account at www.leoandlin.com Under 'My Account', select ‘Create a return' and follow the prompts. We will provide you with a return goods authorisation number which you may use when you arrange for the goods to be collected by our shipping partner. You must make arrangements with our shipping partner for the return within 7 days of receiving your return goods authorisation number. LEO & LIN will not incur any shipping cost, the shipping cost will be incurred by you the customer. You need to place any unwanted items, including all original packaging inside LEO & LIN box with tissue paper wrapping carefully. To be noticed, you don't have to return gift with purchase (chocolate box, flower box and measuring tape). 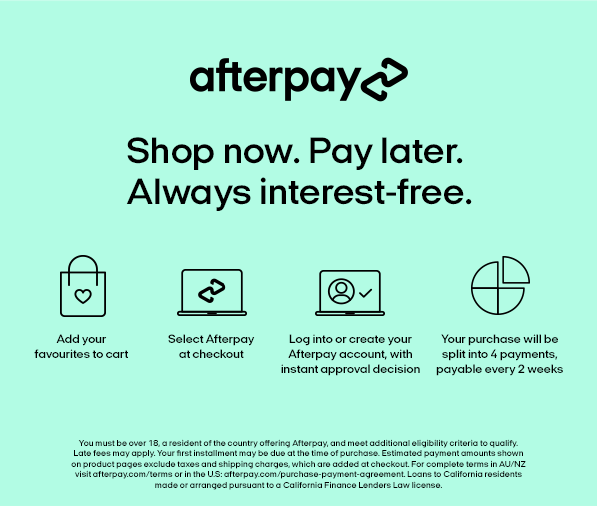 AfterPay allows you to complete your purchase now and make equal fortnightly payments. AfterPay customers must be over 18 years of age, have an Australian residential address and have a debit or credit card. The transaction will be charged to your credit card as soon as the order is confirmed. Can I use multiple methods of payment? At this time we only accept one (1) form of payment per order. Prices are displayed on leoandlin.com in Australian Dollars (AUD) and are inclusive of GST. My order/payment has been declined; do I need to place a new order? Please check with your credit card provider as there can be a number of reasons for this. At LEO & LIN, we value your feedback. Our friendly L & L representatives will endeavour to return your enquiry within 24 hours. If you have any concerned regarding your purchase, please contact our customer services team via email to customerservice@leoandlin.com within 14 days after you have received our delivery confirmation. LEO & LIN now provides same day courier service for our metropolitan customers in Sydney. Same day delivery may be arranged if the delivery address is within Metropolitan Sydney and if you complete your purchase on a business day before 1.00pm. To arrange for a return, please Log into your account at www.leoandlin.com or contact us at customerservice@leoandlin.com. Under 'My Account', select ‘Create a return' and follow the prompts. We will provide you with a return goods authorization number which you may use when you arrange for the goods to be collected by our shipping partner. You must make arrangements with our shipping partner for the return within 7 days of receiving your return goods authorization number. LEO & LIN will not incur any shipping cost, the shipping cost will be incurred by you the customer. You need to place any unwanted items, including all original packaging inside LEO & LIN box with tissue paper wrapping carefully. To be noticed, you don't have to return gift with purchase. When returning items, please enclose: Your Invoice (included in your delivery and The item(s) for return, including packaging. LEO & LIN now provides same day courier service for our customers in Sydney, NSW . Select the same day delivery option at checkout to receive a 3-hour delivery window between 4pm-10pm Monday to Friday. Orders must be placed prior to 1pm in order to schedule same day delivery; alternatively if the cut-off time is missed, an order may be scheduled for next day delivery using our next day or scheduled delivery options. If you are eligible for this service, the Same-Day delivery option will appear during the checkout process. Please select the options and enter your email, and we will notify you once this product is back in stock.